This image originated as a gouache on paper, which was then transferred onto 100% polyester satin. The image was then embellished with embroidery. Since creating this work I've decided I like the original painting better as an illuminated miniature; it doesn't need to be made tactile. I'm working on a series of gouache paintings, the most recent being Bipolar Depression and Family Support. 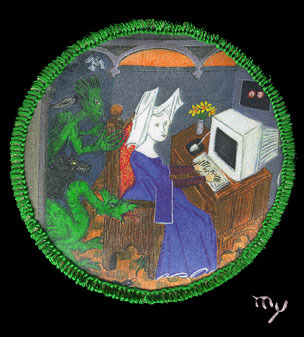 Christine de Pisan at Her Computer was published as an illustration in Well-Behaved Women Seldom Make History, by Laurel Thatcher Ulrich, 2007, Knopf .